It is springtime and the landscapes are looking full and lush! Fresh mulch has been put down and the bees are buzzing. So what is going on with that Nellie Stevens Holly? It is yellowing on the inside and the fresh mulch is now all but buried in a shower of yellow/brown leaves (Image 1). 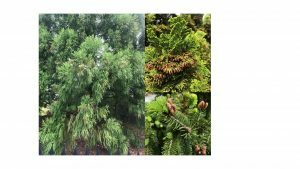 For an arborist at Mead Tree and Turf Care, Inc, the springtime rarely passes without at least one phone call from a client worrying about their evergreen trees. But, rest assured, this is perfectly normal. Image 1. 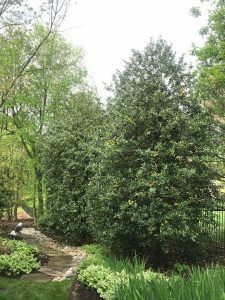 Nellie Stevens Holly losing 3-year old leaves in April 2017. 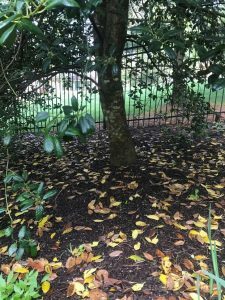 (Left) Yellow leaves on interior of tree are visible (Right) Holly tree leaves covering fresh mulch. It isn’t just the Holly trees causing alarm. Other species of evergreen trees produce cones in the spring that can look like bugs, disease or simply tip dieback (Image 2). Furthermore, as the new candles emerge (Candles refer to the group of needles of evergreen trees), they push off the protective covering which turns brown as they are no longer connected to live tissue. What makes this even more confusing is that trees planted in a group, or trees lining a walkway or driveway, may not produce these cones all at once. Slight differences in climate can occur over a very small area. For example, the right side of the driveway may receive more sun. Or the trees closest to the street may experience slightly warmer temperatures. In effect, the cones and/or leaf drop may not happen at the same time for all the trees on the property. Instead, it may appear that ‘something’ is moving ‘through’ the trees, infecting one tree at a time (or only the trees in a certain section of the yard). Image 2. Evergreen trees producing cones in the springtime. From a distance, this can look like dead tips or some kind of pest or disease. (Left) A Cryptomeria with cones (top right) a chamaecyparis with cones (bottom right) spruce with cones. Finally, evergreen trees are generally not thought of as producing fruit. On occasion, a homeowner may confuse the inconspicuous fruits as a pest or disease. Whatever the case, at Mead Tree and Turf Care, Inc., we encourage our clients to always call our office and schedule a meeting with a Certified Arborist. While everything listed so far is perfectly normal, an Arborist will be able to tell when something isn’t right. Spring is a good time to have your trees evaluated for health. Often, a health issue that is intercepted in the spring may mean that a tree will be able to survive the stresses during the summer months. Image 3. 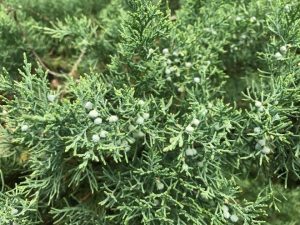 Berries on a juniper in April 2017 may look like a pest or disease to the untrained eye.